Prices for the new Dacia Sandero Hatchback start out from less than £6,000, but don’t let that price tag fool you; there’s a lot of value on offer here. It’s cheap to run, its boot is even bigger than the Ford Focus and it’s very practical. Inside, the Sandero is as basic as basic does, and the entry-level model is sparsely equipped. But if you keep your expectations low and just need a hassle-free car, there’s a lot to like. Join OSV as we take a closer look at what it’s all about with our 2018 Dacia Sandero Hatchback review. There isn’t much to say about the Sandero’s handling prowess, primarily because it hasn’t got any. Instead, Dacia has put entertainment to the backs of their minds and focused on making the car as comfortable as possible. To this end, they’ve largely succeeded. There’s a lot of grip on offer and the car feels safe, secure and fairly well planted. However, there are caveats. The steering is overly heavy for the towns and cities (where this type of car is meant to excel) and there’s a noticeable amount of kickback, which might dent your confidence as you take on corners. On the other hand, the Dacia Sandero wasn’t designed to be a car that we drive with lots of enthusiasm anyway. As long as you take it easy, drive sensibly and don’t go crazy, you and your passengers will be able to enjoy a very laid-back on-the-road experience. Indeed, for a car at this price point, we’d argue that there’s nothing wrong with it. There’s no automatic gearbox, but supermini’s as a general rule perform better with manuals anyway. In terms of the engines, the entry-level petrol model is the cheapest in the range. It’s an sCE 75 1.0-litre engine that was only introduced last year. It’s better than its predecessor, and it develops a healthy 74bhp and has a 0-62 time of 14.2 seconds. It’s pleasant and responsive enough but it lacks oomph, has to be worked hard, and is the engine we’d overlook. The turbocharged 0.9-litre TCe 90 petrol engine is a better shout. It gets three cylinders, produces 89bhp and completes the 0-62 dash in 11.1 seconds. It’s just at home on the motorway as it is in the city, and although it feels lethargic when ascending steeper inclines, it’s a good all-rounder. Inside, the Sandero is probably as basic as you’d expect – especially if you go for the entry-level model. This is budget friendly stuff, but it’s actually not as bad as we thought it was going to be. See, basic cabins aren’t as low key as they were in the eighties. The Sandero’s interior is presentable and totally possible to live with. True, its hard plastics won’t show up well against the soft touch plastics of rivals, but the cabin does a good job. The functional dashboard is well-built and logically arranged, but it’s a shame that the entry and mid-range models don’t come with full seats and steering wheel adjustability. Other than that, a recent facelift means the car now has better materials than last time, as well as a brand new four-spoke steering wheel. Is the Dacia Sandero Diesel Hatchback practical? It’s hard to complain about the amount of space on offer at this price point, and the Dacia is a very usable car. A 320-litre boot is one of the biggest in this class, and folding the rear seats extends it to 1,200-litres. The Sandero gets five doors, impressive cabin storage includes a deep glovebox, and visibility is fantastic. The entry-level model is very spartan and as fuss-free and basic as a car can be in 2018. Most buyers have been prepared to pay extra for the mid-range Ambiance model, which comes with Bluetooth, a digital radio, central locking, electric windows and air conditioning. The range-topping Laureate trim gets a trip computer, sat-nav, a seven-inch infotainment system, cruise control, a speed limiter and rear parking sensors, while a reversing camera is optional. In terms of how safe the car is, the Sandero only scored 3/5 for its Euro NCAP crash test performance. However, it did score well for both adult and child occupation. Its standard safety kit is good and includes seatbelt warning buzzers, airbags, electronic stability control, rear child locks, emergency braking assistance and anti-lock brakes. Prices for the new car start out from £5,995 and rise to £10,800. For more information on our leasing deals, you can check out our page here. In terms of its running costs, a brand new three-cylinder 1.0-litre SCe 75 petrol engine replaced the dated 1.2-litre unit and it’s much cheaper to run. It returns 54.3mpg and emits 116g/km of CO2, which gives it a BiK rating of 22%. A turbocharged 0.9-litre TCe petrol engine costs more to buy and is an overall more sophisticated engine. It averages 57.6.mpg and emits just 109g/km of CO2, which gives it a BiK rating of 20%. All Sandero models cost £140 to tax, while the 1.0-litre petrol engine sits in insurance group 2. It’s very hard to find much wrong with a car that costs less than £6,000. With affordable running costs and a practical cabin, it offers superb value. It’s not much fun, but it’s super easy to drive and offers a largely hassle-free on the road experience. As well as being inexpensive to buy, the 1.0-litre petrol engine sits in insurance group 2 out of 50. Its reserved, dull styling might be a deal breaker for some. Some of you will prefer to splash the extra cash on a car with a smarter interior. 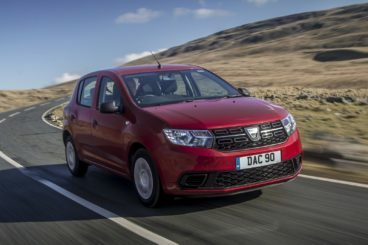 Let’s see how the car compares against its rivals in the comparison section of our 2018 Dacia Sandero Hatchback review. The new Peugeot 108 is stylish, cheap to run and buy – but is starting to show its age a little. In the towns and cities, the 108 is – like most cars of its type – perfectly at home. Out on the motorway, however, it begins to feel out of its depth. Its steering is nice and light, and its ride quality is better than last time. With no diesel engine available, buyers get to choose from a pair of petrols. There are two on offer, although the less powerful variant is the only one that can be paired up with an automatic gearbox. It’s also the only one that can be specified with stop-start tech. It’s a 1.0-litre unit that’s zippy, agile and good fun to drive in urban settings. If you’re planning on hitting the motorway regularly, though, we’d much rather recommend the 1.2-litre petrol engine. It covers the 0-62 dash in 10.9 seconds, while the smaller engine covers it in 13.0 seconds. That said, you can only get your hands on the bigger engine if you’re prepared to spend extra on either the Allure, GT-Line and Roland Garros. Just so you know, there are five trim levels, and these are the top three. Running costs? All models cost £140 a year to tax, while the 1.0-litre engine is the most frugal overall with its returns of 69mpg. The 1.2-litre engine isn’t too far behind, and can return 65.6mpg while emitting less than 100g/km of CO2. There’s a big difference where insurance is concerned; the smaller engine occupies group six, while the bigger engine sits in group 12. Inside, the 108 is basically an improved version of the 107. Whereas that car felt and looked a bit cheap and unwelcoming, the 108 is the opposite. It deals with lumps and bumps better, and insulation is actually pretty decent this time around. Wind and tyre noise is suppressed much more and you’ll be able to hear yourselves talk on the motorway. Its dashboard, meanwhile, is tastefully done – if a tad simple – and all models come with a seven-inch touchscreen. 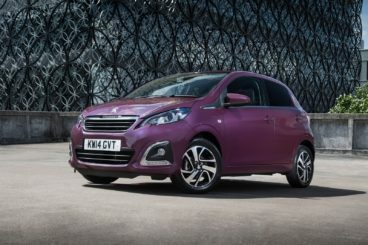 Is the Peugeot 108 practical? Four people can squeeze inside here, but if you’re on a budget and can’t afford to go above the entry-level model, you’ll have to make do with a three-door. All the other models get five doors, which of course improves access to the rear seats. It’s a compact car, which makes it easy to drive and park, and visibility is very good. 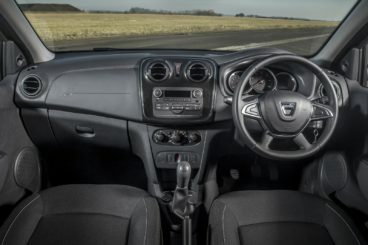 There’s plenty of space up front and the steering wheel and driver’s seat offer more adjustability than the Dacia, while all models get electric front windows, remote central locking and power steering, too. The boot measures 196-litres, though, which is miles off the Sandero. The new Toyota Aygo is one of the best-looking cars in this class, and its bold design is complemented by some smart handling. On the road, the Aygo is agile, fun and even comfy. Its natural habitat is in the city, but it doesn’t feel too overawed out on the motorway either. Its compact dimensions ensure it’s easy to live within urban sprawls, while a high seating position means visibility is excellent. The steering is more direct than last time, but one issue is that body lean seems excessive in bends. Ride quality is good on decent surfaces, but it’s much less impressive once you hit broken roads. Buyers can choose between a 5-speed manual ‘box and a 5-speed automatic, but there is no diesel engine. Instead, there’s just a sole 1.0-litre petrol engine, which is the same one that powers the Peugeot 108. It’s not exactly fast and takes 14.2 seconds to complete the 0-62 dash if you stick to the manual transmission. Specify the automatic, and it takes even longer to complete the same dash – 15.5 seconds. The engine needs to be worked hard but it never feels like a chore. And while it produces just 68bhp, it has more than enough pace to keep up with city traffic. It’s also decent at overtaking. Running costs? The Aygo emits 95g/km of CO2 and has a BiK rating of just 18%. It can return 68.9mpg, and road tax will set you back £120 for the first year and £140 for each year thereafter. Inside, the Aygo is much better than last time. Fit and finish are particularly better, while insulation has also been improved. You will hear the engine’s thrum but it’s a nice, non-distracting noise, while wind and tyre noise has been well suppressed. The dashboard is finished in gloss-black and looks youthful and fresh. It’s a shame that there are harder plastics here and there, but it’s overall a step up from the Sandero. However, the entry-level model misses out on a height adjustable driver’s seat. 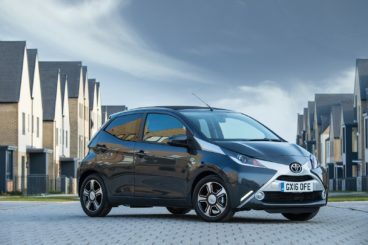 Is the Toyota Aygo practical? It’s not very big, but a double bubble roof means headroom is better than last time, although rear legroom is sparse. The tall front seats and small rear windows may create a sense of claustrophobia in the back. Space up front is fine, while storage solutions include a decent glovebox. Buyers can choose between a three and five-door model, while the boot measures a paltry 168-litres. That compares very unfavourably to the Dacia, and it isn’t an accessible boot either. Does the Dacia Sandero provide a solution to a problem? Yes – but nothing more. An easygoing, practical way of completing your on-the-road chores, this car is budget friendly and user-friendly. If you need a stopgap between cars and want to spend money elsewhere, the Dacia Sandero Hatchback is an excellent choice.